Looking for patient recruitment? Check the Baltics! 23 Feb Looking for patient recruitment? Check the Baltics! Clinical trials in their modern meaning have been carried out in the Baltics since the early 1990s and during the last decade the region authorized an average of 78 new clinical trial applications per country per year. The peak of new clinical trial applications in the Baltics was observed in 2008 and the new clinical trial application dynamics can be considered as rather stable since then (Figure 1). Oncology is by far the most researched area in the Baltics, with an average of 27 new applications approved per country during the last three years (Figure 2). There are some notable differences country by country, with Lithuania approving nearly twice as much applications in Endocrinology and Cardiology compared to Latvia and Estonia. However, Estonia has a significantly higher number of approved applications within infectious diseases and Latvia leads the way in pulmonology / allergology during 2011-2013. According to national health statistics, by the end of 2012 there were 260 hospitals operating in the region. As a rule, healthcare units concentrated in the bigger cities are well-equipped and can perform CT, MRI examinations etc. There is also a vast number of laboratories, both state owned and private, offering high quality tests. Baltic investigators are motivated to work and do the job well. Besides the financial reasons, they see clinical trials as an opportunity to improve their qualifications, as well as to provide patients with free modern treatment and diagnostics. GCP trainings are well organized in the Baltics and most of the investigators are GCP trained. GCP trainings in Lithuania are regulated by the law, which requires investigators to attend basic 8 hours GCP training and refresh their knowledge in 4 hour courses every five years. Though there is no such requirement in Estonia and Latvia, several big medical Institutions organise GCP trainings for their employees participating in clinical trials every two years. There are no restrictions for clinical trial contracting in the Baltics. In practice, sponsors and/or contract research organizations usually sign two types of contracts – one with the institution and one directly with the investigator. The shares of payments are determined by the institutions. The payment size mainly depends on the rates adopted by the institution to cover the facility amortization and labour costs, which correlates to the complexity of the protocol procedures (patient examinations, physician and medical personnel time consumption, use of equipment, length of hospitalization, rate of return, etc.). The share of funds received by the institution typically ranges from 10% to 25% of the total clinical study budget per patient. It should be noted, that the instrumental and laboratory tests conducted in medical institutions have to be paid separately. 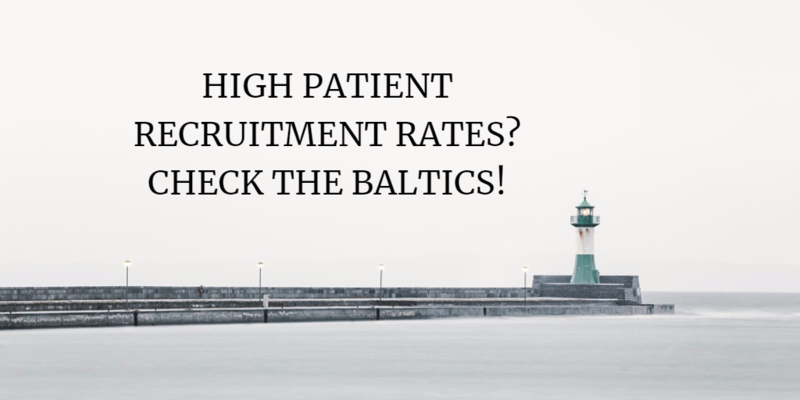 Baltic countries are well known among the clinical research community for excellent patient recruitment. 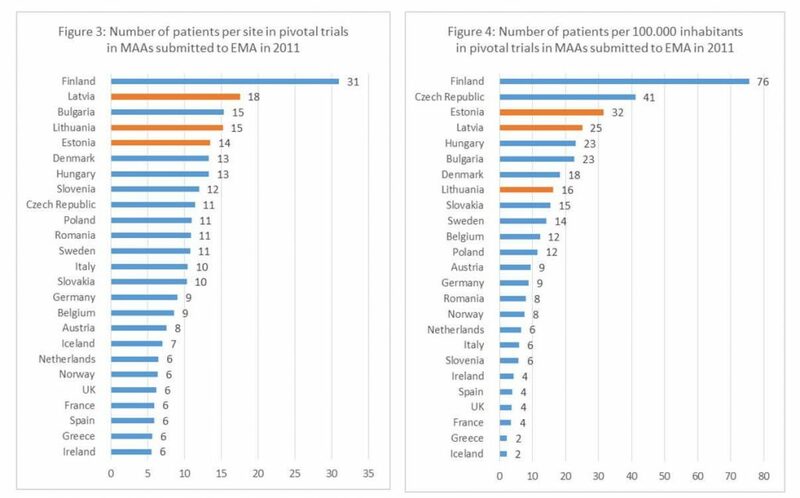 According to the European Medicines Agency’s (EMA) report on patient recruitment and geographical location of clinical trials, all three Baltic countries stand among the top five countries in Europe according to patients recruited per site in pivotal trials submitted with Marketing Authorization Applications (MAAs) to EMA in 2011 (Figures 3 and 4). All regulatory documents are translated to English and available on the websites of national competent authorities and ethics committees. The competent authorities (CA) governing clinical trials in the Baltics are State Medicines Control Agency of Lithuania, State Agency of Medicines of Latvia and State Agency of Medicines of Estonia. There are no local ethics committees in Baltics and the ethical reviews is done at a central ethics committees (CEC). There is a single central ethics committee in Lithuania, while there are 4 and 2 in Estonia and Latvia respectively. A single CEC opinion is required in each country to initiate a trial and the applicant is free to decide to which CEC to apply in Latvia and Estonia. It is important to be aware that, in addition to the competent authority and the ethics committee, in order to proceed with a study in Lithuania an approval from the State Data Protection Inspectorate (SDPI) must be obtained. The applications may be submitted in parallel to all the institutions. However, in order to speed up the process it should be done in an appropriate sequence, having in mind that the competent authorities issue the approval only after a favorable opinion of ethics committee is in place and SDIP will issue the approval only after favorable opinions from competent authority and ethics committee are in place. Based on experience, if the documentation is complete, in good quality and is submitted putting in mind the institution’s meeting schedules, all the necessary approvals can be received in approximately 60 days. It is also worth mentioning that all three Baltic countries accept applications submitted through the international harmonization procedure (in accordance with the European guidelines regarding the voluntary harmonization procedure for evaluation of multinational clinical trials).